Some people do a great job using outlines to create masterful books. Unfortunately, I’m not one of those people. There’s something about making an outline that gives me the creeps. Seriously. I’ll actually get a panic attack when I attempt to outline. I’ll beg my friends to help me plot. I’ll clean the house. I’ll take my library books back. I’ll do anything else on my to-do list, except work on my outline. Sometimes, if I absolutely have to, I can put together an outline. But then, when I sit down to write the book, I rarely follow the outline that took three panic attacks, four sleepless nights, and five phone calls to my closest writer friends to create. On the other hand, I’m really good at doing character sketches. And figuring out my theme. And I almost always know both the beginning and the ending of my story. It took me a really long time to figure out that I’m more of a discovery writer or an intuitive writer than a writer who focuses on plot. When I’m in the midst of writing, I feel like I’m following a two-lane road through the wilderness, wearing a blindfold, and one of my hands is trailing along the raised pavement markers like braille, like they’ll tell me where I’m going. I’m a little bit lost, but I know I’ll get where I’m going. Eventually. If I outline a story, I don’t want to write it. I already know all the secrets. I like to write for the same reason I like to read—to learn new things about myself and the world around me. It might sound crazy (okay, it definitely sounds crazy! ), but that’s what I love about writing. It can take me anywhere. It surprises me. It astonishes me. It scares me, it breaks my heart, it makes me cry. If I actually experience fear, sorrow, love, anguish and betrayal when I’m writing, then I know I’ve hit the heart of my story. I know I’m writing something that other people are going to like too. Writing the first draft is how I find the heart of my story. Editing that draft is how I find the music. Sentence structure, paragraph structure, word choice and the rhythm of the words all work together to make a story that sings. I’m not happy with my work until it resonates, both emotionally and rhythmically. There are a lot of people who use outlines and I secretly wish I were one of them. But if you’re a discovery writer, like me, then I hope you find a system that works for you and, please, don’t let other people tell you that you’re doing it wrong. Your way is the best way. And don’t stop writing, no matter how many drafts it takes, until your story resonates with you. Also...I have a new book out. (YAY!) 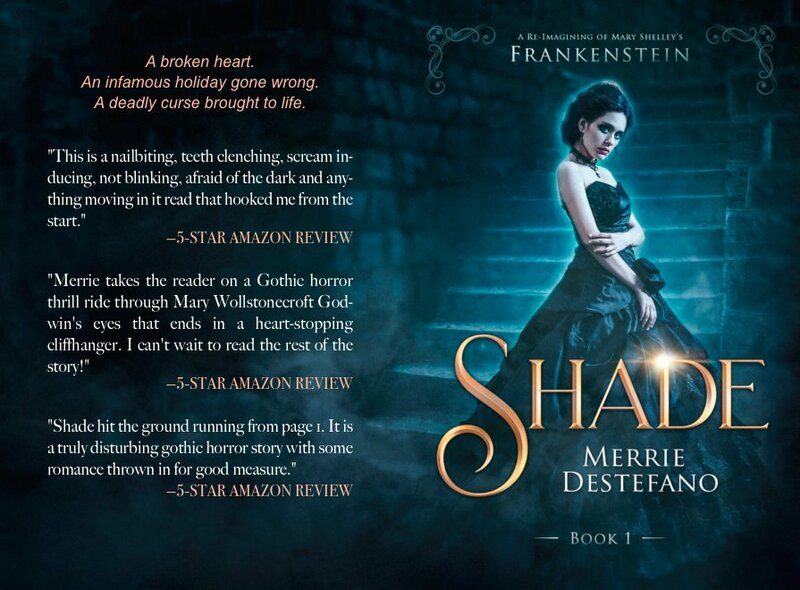 Shade: A Re-Imagining of Mary Shelley's Frankenstein released a couple of days ago. Here's my latest 5-star review for this book: "This retelling is amazing and I couldn't hardly put it down. Beautifully written. Can't wait for the next installment. "—Maria on Amazon. SHADE is only .99 and you can purchase it here. Or you can purchase the entire series for only $3.97 here. Also, I have a cool giveaway for you! 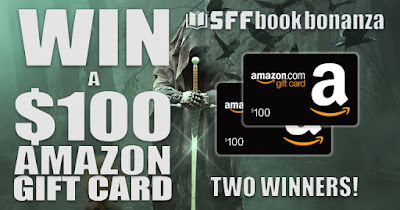 Two winners will receive a $100 Amazon giftcards! (Imagine all the cool books you could buy!) The link to enter is here and all the info about the contest is there too. May the odds be in your favor and thanks for stopping by! Novelist and magazine editor, Merrie Destefano writes dark stories with a thread of hope. She’s the editor of Victorian Homes magazine, Zombies magazine, and Haunted: Mysteries and Legends magazine. Her novels include Afterlife, Feast, Lost Girls, and Fathom and she’s been published by HarperCollins and Entangled Teen. 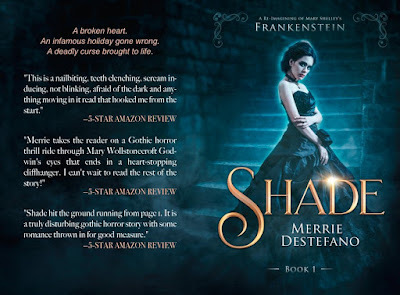 Her latest release, Shade: A Re-Imagining of Mary Shelley’s Frankenstein, released on May 1st, and her next novel, Valiant, is scheduled to release in December, 2018. For more information, visit her website at www.merriedestefano.com.